I love so many of Stampington and Company magazines. I picked up the Autumn 2012 issue of Haute Handbags because there were so many projects I thought were adorable and that I thought I might make. 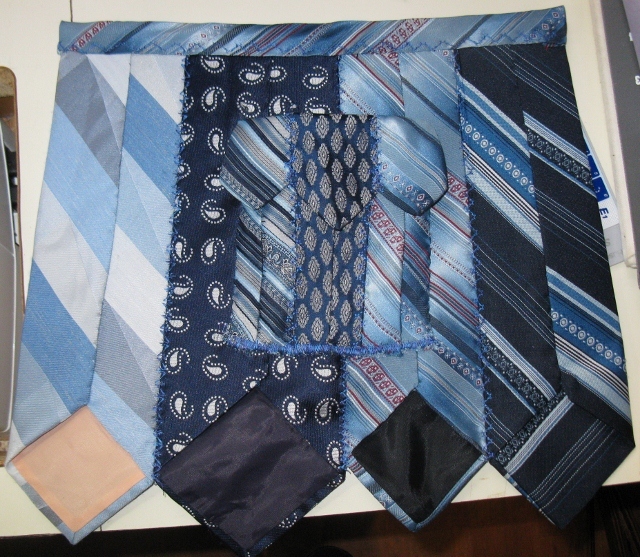 I liked Carolynne Templeman’s article about repurposing mens’ neckties. I read through her instructions for making the “double sided tie bag” and then made my own version making a few alterations. 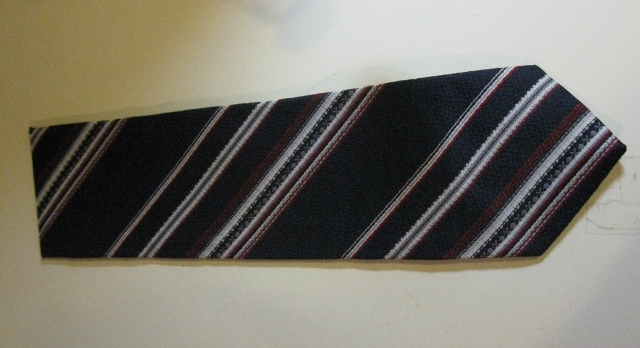 I have to say I have been given ties for years (hint: I’ll gladly take any you have to offer!) so I have quite a stash. I found 10 I thought my Mom would like, that coordinated well. I decided to make my bag 4 ties wide and 10 inches tall. 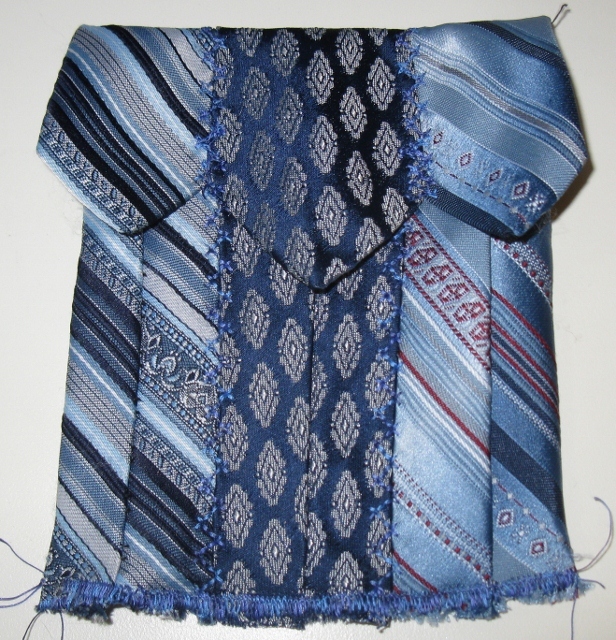 I used the lining as a pattern for cutting a piece of Fast 2 Fuse (Double-sided fusible stiff interfacing in Heavy Weight) and re-lined the tie and stitched it carefully by hand. 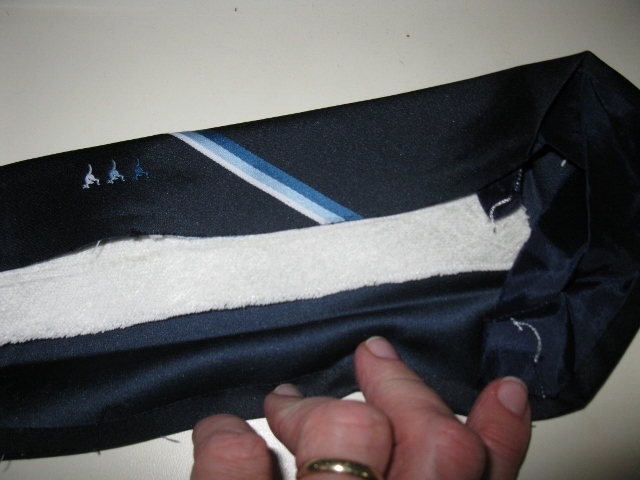 The back side of the tie becomes the inside of the purse. 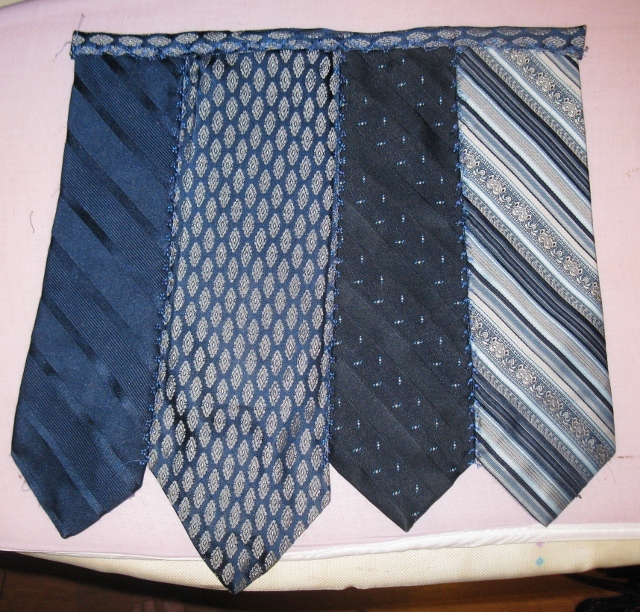 I repeated the process for 8 ties. Repeat the process to make the other side of the bag. 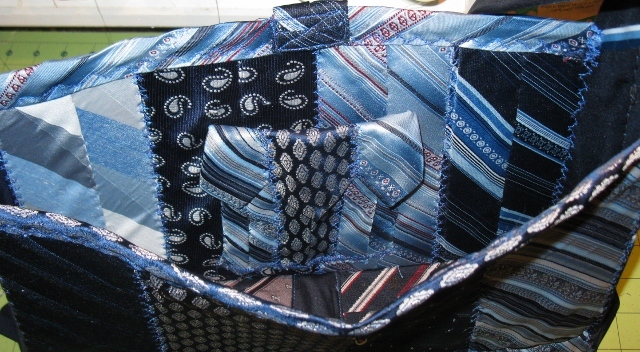 I used 2 ties to make the sides and handle for the bag. I lined the bottom 10 inches with Fast 2 Fuse and the upper ends with Pellon Medium Weight fusible interfacing. 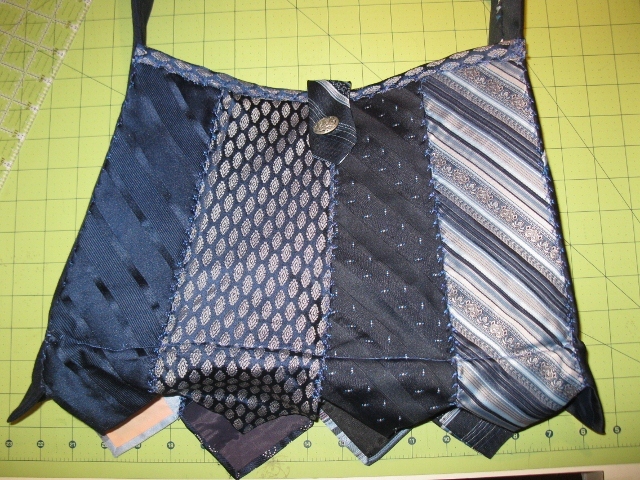 I sewed the sides in using the same method I used for sewing all the ties together. Carolynne suggests using a piece of heavy fabric for the bottom of the bag, but I had all these cut up ties laying all over my floor so I used two pieces, lined them with Fast 2 Fuse and sewed them together to create a piece large enough for the bottom of the bag. I used one small tie end for a closure. I sewed a pretty button to one side and a snap opposite the button and then sewed the opposite half of the snap to the body of the bag. I sent it to my mom for her birthday and she LOVED it! I liked it so much I’m thinking I may have to go dig into that stash of ties again to make one for me! Posted in Uncategorized and tagged bags, purse, quilting, sewing, ties, upcycle. Bookmark the permalink.